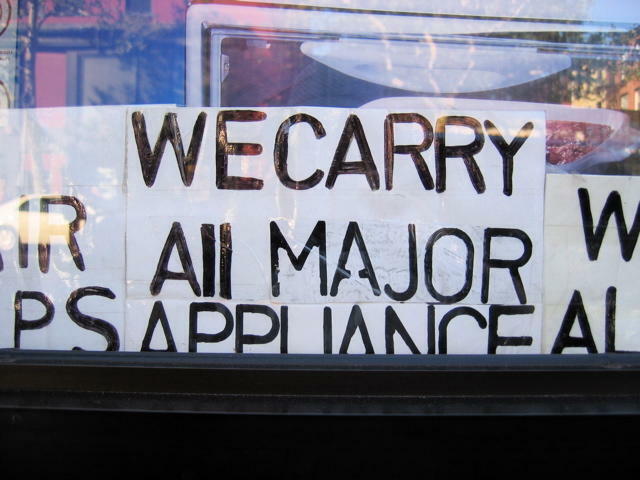 At first glance this sign found in the window of a 7th Ave. dollar store seems a typical case of lowercase L. WE CARRY All MAJOR APPLIANCE, simple enough. But upon further inspection, we find something very peculiar. Click on the close-up photo to the left to see a larger view. 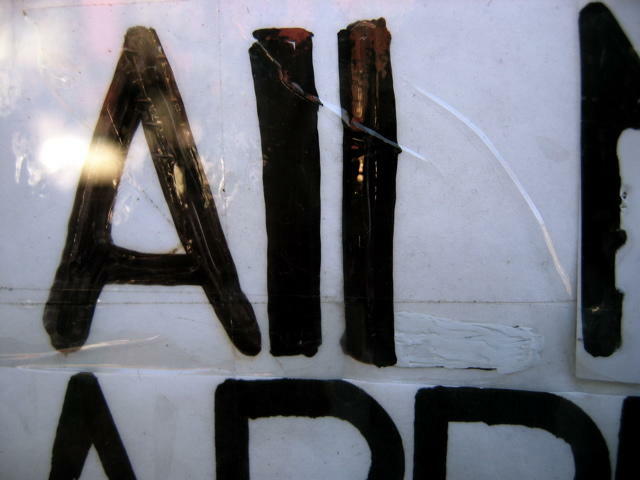 Notice the White-Out applied to what used to be the lower portion of an uppercase L. What could possibly explain this disturbing behavior? It seems the author had previously written the word ALL with at least one uppercase L. Perhaps the middle L was squeezed in after the final L was doctored to look lowercase? Did a second, deranged author surreptitiously modify this signage in an attempt to discredit the first author? 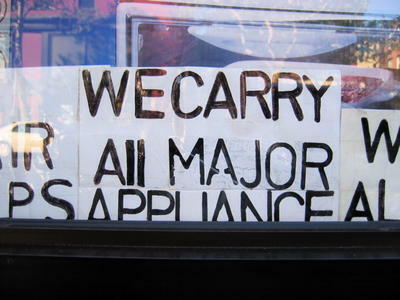 And the word MAJOR was taped over whatever else used to be there, as well as the word APPLIANCE. This is all just too suspicious if you ask me. It's one big cover-up for the lowercase L conspiracy that is emerging right under our noses. I urge you to send in more examples so that we may learn from example and understand this threat to society. But be cautious, trust no one. wow, the worLd just gets crazier & crazier. The Byzantine syntactical rules regarding when to use a lower case L with all caps (and when not to) can be maddening, but what its even more crazy making is when you, a humble dollar store sign painter, attempt to follow them as best you can, and end up with a construction like "AlL" which looks a lot like to the untrained eye like "Ail." Or perhaps that person's manager didn't realise that AlL is a valid (though insane) construction, and made her change it.